KATHMANDU, Nov 30: Protesting locals in the hill districts of Province 5 as well as local supporters of the ruling Nepali Congress and CPN (Maoist Center) have upped the ante in their respective areas while pressing their demand for keeping the province intact. Protests have flared up in various districts of Province 5 at a time when the government is all set to table the constitution amendment proposal under which the districts of Palpa, Gulmi, Pyuthan, Arghakhachi, Rolpa and the eastern part of Rukum will become detached from the province. All these provinces will be merged with Province 4, as per the amendment proposal. While Nepali Congress and the CPN (Maoist Center) are for changing the provincial borders, the main opposition CPN-UML is dead against the idea. Unhappy with the government's preparations to split the province, the locals of Pyuthan, Rolpa and Dang have already started taking to the streets day after day to protest against the government's move. Locals who spontaneously converged on district headquarters Liwang to protest have been enforcing a shutdown in the district since the last seven days. Locals joined the protests after putting down their daily work, and closed the local markers. The markets remained closed from early morning and opened only after 5 p.m. Irked by the government's move, the locals have announced a series of protests. "Almost all the people in our district are against the move and it will be suicidal for the government to press ahead with it," said NC lawmaker and party district chapter president Amar Singh Pun, adding, "Rolpalis are not buying the move no matter what." Pun himself is leading the protests in Rolpa. In Pyuthan, protests organized under the leadership of former NC parliamentarian Mukti Prasad Sharma are under way. A meeting of the locals on Tuesday decided to further expedite the protests. "So far our protests were just confined to rallies and meetings," said NC district secretary Devendra Barma, "Now onwards we are making them more intense." In a bid to bolster their protests, locals from Rolpa and Pyuthan have reached an understanding to proceed jointly. "We are planning a joint movement against the government. One thing is clear;it will prove costly for the government if it thinks about suppressing the protests," said Barma. Politicians in Dang have also started protesting after reaching the conclusion that the idea behind splitting districts away from Province 5 was to not make Dang the provincial capital. They have also demanded the inclusion in Province 5 of the western part of Rukum and Salyan. These districts are currently in Province 6. "The way the government is preparing to take districts away from Province 5 is not acceptable for us," said Sudeep Gauam, president of the Federation of Nepalese Journalists Dang chapter. He warned of strong protests in the coming days if the government does not backtrack. Gautam, who is coordinating the protests in the district, informed that the locals had dispatched a memorandum to the prime minister demanding that the districts not be taken away from Province 5. Similarly, hundreds of students and political leaders aligned with NC, CPN-UML and the Maoists have taken to the streets in Arghakhachi district. On Tuesday, they demonstrated in Sandhikharka bazaar, demanding that Province 5 be left intact as provisioned in the new Constitution. They have warned of continued protests unless the government backtracks from its decision. 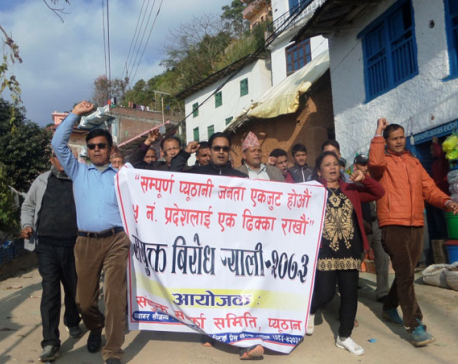 "Our demonstrations will continue unless the government withdraws its constitution amendment proposal separating the hill districts from Province 5," said Narayan Khadka, district president of the Tarun Dal. On the occasion, Govinda Acharya, chairman of the Youth Association Nepal (YAN), said, "The five hill districts of Province 5 do not want to be separated from the tarai and a decision taken against the will of the people is unacceptable to them. Echoing the views of other leaders, Thakur Saurag, in-charge of the Young Communist League (YCL), youth wing of the ruling Maoist party, suggested to his party not to split the province, saying this will be against the spirit of federalism, identity and economic viability.